Drew Angerer/Getty ImagesFacebook CEO Mark Zuckerberg. Facebook CEO Mark Zuckerberg discussed Facebook’s role in society on the ‘Freakonomics Radio’ podcast. 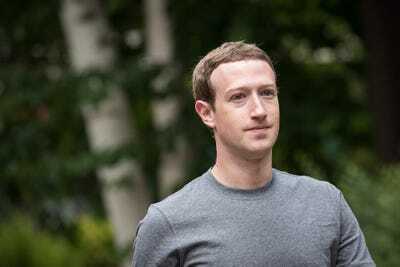 Zuckerberg said his original goal was for Facebook to spread openness and foster connection among users. But concerns over misinformation and tech addiction have arisen. The interview comes amid a growing chorus of backlash against big tech companies. Amid a growing backlash over how big tech companies are impacting society, Facebook CEO Mark Zuckerberg said the world is more divided than he ever anticipated. Facebook has come under fire from people in and outside of the tech world due to issues of tech addiction and the platform’s role in spreading misinformation during the contentious 2016 election. Since then, the social network has instituted a series of changes to its news feed that have actually reduced the total time users spend on the site by up to 50 million hours per day. Zuckerberg told Dubner that Facebook, in his view, has a responsibility to work on connecting people across ideological divides. He said that while he believes most people mean to do well by each other, “confronting truths or perspectives that don’t fit with ours” can cause people to lash out. In Zuckerberg’s view, social networks like Facebook should provide a productive starting point for discussion by helping people bond over things they have in common. There are “lots of different issues and things that help bind people together,” Zuckerberg said, including a well-functioning economy and the jobs it provides. To help boost economic opportunity around the world, he said, Facebook is working to spread the internet – and the opportunity for new jobs and connections it brings – to underserved communities. Of course, that would also lead to more new Facebook users.